Making jewelry and objects from semi-precious metals, stones, and non-precious found materials has culminated from my interest in design and my need to make things with my hands. The aesthetics I use are the same throughout all of my work, most importantly the combination, coordination, composition, and collaboration between old and new. I also aim to recycle and re-purpose objects to give them a new life in a different context. When I find pieces that attract or interest me, I think…what can I do with this? When I find an answer, the piece is created and built around the object. They are both architecture and collages on a miniature scale. Many pieces have grown out of a challenge to use materials or objects that I have found and collected. These pieces are less about the traditional craft of jewelry making and more about making intimate objects that have a narrative to tell and can be worn and shared with others. Unlike an art piece on a wall in a home, jewelry can interact with the wearer’s lifestyle. Some of the pieces are experimental and playful, although three main themes are prevalent: maps, texts, and watch parts. The maps and texts directly relate to place: Italy. This is where I learned the craft of jewelry making and where I now live and work. The maps are segments, pieces or places, not necessarily specific, relating to random bits of memory about travels. The texts are in Italian and are usually words or phrases from vintage poetry books taken out of context, yet singularly meaningful and precious when presented as a “jewel”. I began using vintage watch parts because I was primarily interested in the graphic nature of the watch faces and curious about the technical beauty of the inner movements which are being produced less and less these days. These watches have been worn, discarded and dismantled into parts. I began to wonder where these watches have traveled and on whose wrist. 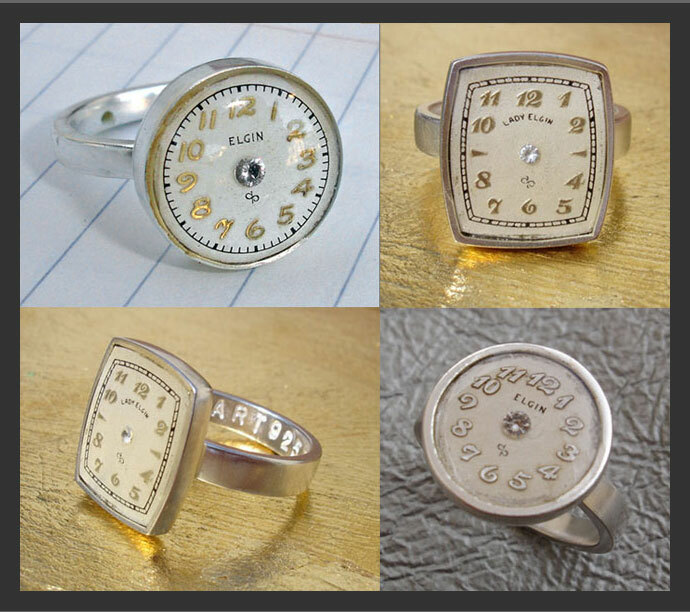 When I found watches made by the now defunct Elgin National Watch Company (Elgin, Illinois), the obvious hit me like a arrow. From Italy, I am able to find Elgin watch parts sold internationally. The irony is that I am from Elgin, Illinois, and I remember the old watch factory, a historic building where now a shopping mall stands. Now across the world, I can be subtly reminded of my childhood and of the passage of time from then to now. Because the jewelry pieces are void of the watch hands and are set in resin, I want to freeze time, preserve the “lives” of these watch parts and make them timeless. 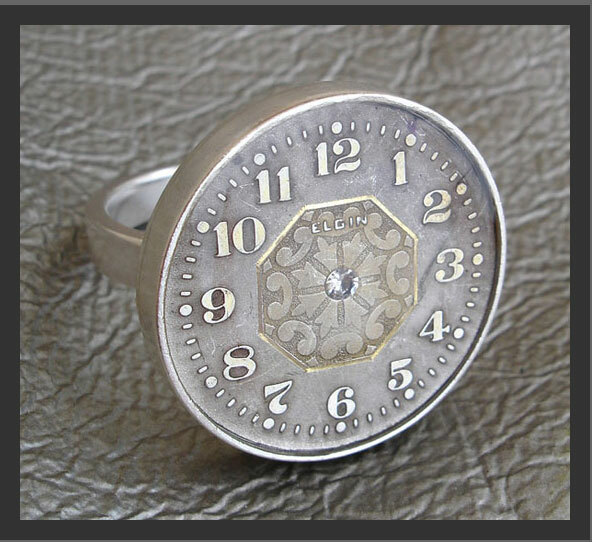 More soon on vintage Elgin watches….